This article is shared with permission from our friends at Wellness Mama. 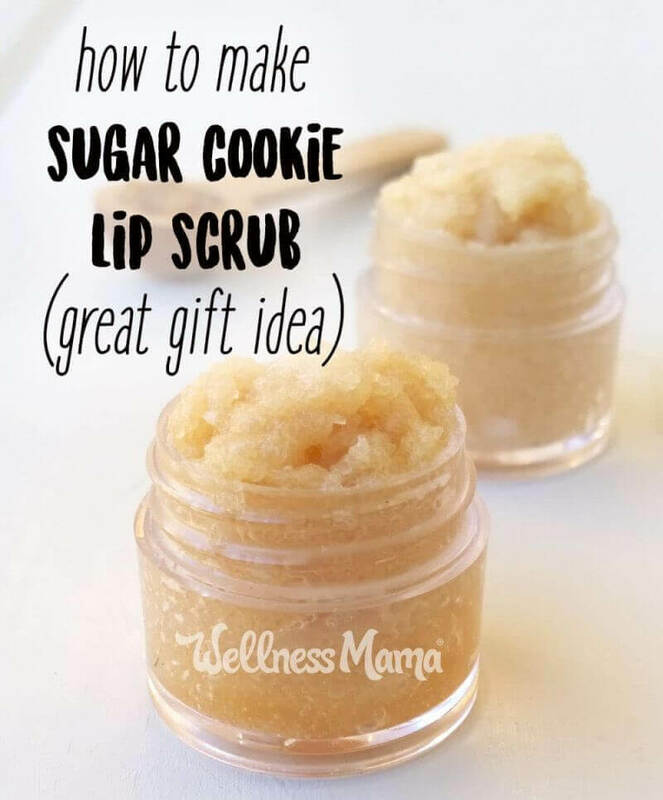 While we all know that the sugar in traditional sugar cookies is detrimental to our health, you can still get all of the flavors of homemade cookies with this fun lip scrub recipe. It tastes and smells just like a sugar cookie. Even better, though, it will exfoliate and nourish your lips, without putting a dent in your healthy lifestyle. I never used to pay much attention to lip scrubs. During the winter when dry lips would hit I’d reach for some homemade lip balm, like this peppermint one. However, lip scrubs help to exfoliate the build up of dead skin that gives lips that crusty, gummy feel. Not only are you getting rid of the gunk on your lips, but the oils and honey in this help to nourish the delicate skin on this facial area. I still like to follow it up with some homemade lip balm for extra moisture during the winter months. Coconut oil has lots of uses for skin and hair, and it’s also a healthy addition to your diet. In this lip scrub, it provides moisture, antioxidants, and helps thicken the product. If you’re looking for more ways to incorporate this superfood into your life, then try making some tooth remineralizing chews. Sweet almond oil is the liquid carrier oil here, as it helps to smooth everything out. You can substitute another liquid carrier oil of your choice. However, the sweet, nutty smell of sweet almond really adds to the sugar cookie vibe. The fatty acids, and vitamins A and E make sweet almond oil the perfect choice to nourish lips. Like the carrier oils, raw honey helps to add moisture to the lips. It also has healing properties to restore and rejuvenate damaged lips. It’s so powerful that naturally antibacterial raw honey is even used to speed healing of wounds and burns. Raw honey is also slightly emulsifying, so it helps to bind the ingredients in this lip scrub recipe together. You can read more about the healing uses of raw honey here. Vanilla extract gives this lip scrub recipe a true sugar cookie smell and taste. I like making my own homemade vanilla extract (get the recipe here), but for this, it’s best to use a glycerin based vanilla extract. If you only have access to alcohol-based vanilla extract, you can still use it since there is enough moisture in the other ingredients to make up for it. Glycerin acts as a humectant to add moisture to the lips, while alcohol is more drying. It is a common ingredient in even many natural kinds of toothpaste, but I purposefully avoid it in my homemade toothpaste. While glycerin is thought to coat the enamel and promote tooth decay, it’s very soothing to skin and lips, so it’s great for skincare. Make sure you’re leaning over a sink when you use this since it’s fairly messy to use. Here are a few more natural beauty products you can make at home!